Although Alan ascribed to this philosophy personally, Conservation Enforcement Officers under his watch came to be better equipped and trained than ever in history. Despite being known for his frugality, he never cut corners when decisions were made about equipping front line officers. In fact, the former Chief’s careful spending was a big part of what enabled the Wildlife and Freshwater Fisheries Division to continue to issue state-of-the-art equipment as needed to stay current with needs of employees in the field. This is not to say that the good Chief was a person to jump on the newest fad or gadget, though. For over 12 years, I watched him go through a very deliberate decision-making process about what to buy and what not to buy. For example, on one occasion he was under considerable pressure from a particular officer to issue an additional intermediate force weapon, one fairly widely in use among law enforcement agencies at the time. Alan had a vast amount of field experience under his belt, and had worked some pretty tough counties on his way up the ladder. But instead of relying solely on his own well-founded knowledge, he consulted with the district supervisors—Law Enforcement Captains—across the state, and with his counterparts in other states. He thoroughly researched the matter, and ultimately made the decision not to issue the particular item. At the time, officers were trained and equipped with .40 caliber Glock handguns, Remington 870 riot guns, AR-15 or similar rifles as needed, pepper spray, and ASP batons. Additionally, all officers were intensively trained in an extremely effective defensive tactics methodology built around grappling and ground-fighting techniques, over and above the ordinary Pressure Point Control Techniques taught at the basic law enforcement academy. The criteria Alan used in making the decision had nothing to do with cost. Instead, he focused on two key issues. The first was appropriateness for use in conservation law enforcement. The second was something that would not have occurred to me, but instinctively came to Alan’s mind: The more choices an officer has to make in the split second that his life may be on the line, the slower the reaction time. Although a far cry from the sometimes life-or-death, pressure-cooker decisions law enforcement officers have to make, the same principle applies to us as hunters. The more stuff we have, the less focused on the matter at hand we are. As hunters, in today’s world of bigger-is-better, more-is-better, there is a tendency we all share to one degree or another, a tendency to focus on bigger animals or bigger caliber arms. This same tendency makes some among us suckers for the latest gadget or gimmick, to the point they can barely carry it all. Deer and turkeys have become the most popular game animals. For some of us, this order of popularity is the reverse of that just stated. However, squirrels, rabbits, dove, quail, and other small game have much to offer in the way of just sheer, raw fun, the opportunity for social interaction, and wonderful table fare. Many tens of thousands of hunters take to the forests and fields of Alabama every year in pursuit of small game. How long has it been since you took a .22 rifle or single-shot shotgun and a pocket full of shells and went hunting for small game? If you haven’t done it in a while, you may want to give it a try. 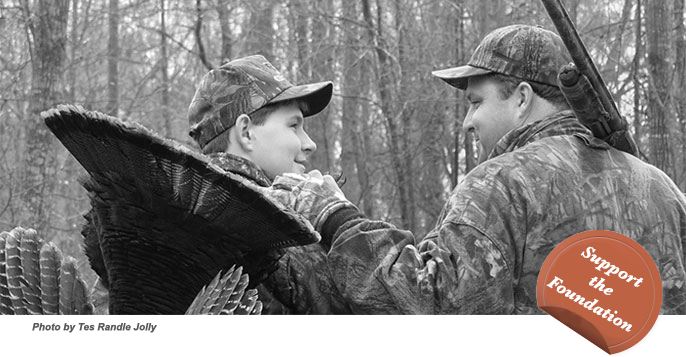 Especially if there is a younger person you are introducing to hunting, small game is the best starting point. The simpler equipment, increased ability to move around some and make some noise, and opportunity to shoot the gun more all appeal to younger hunters more than sitting absolutely quiet and still for half a day in order to maybe fire one shot from a high-powered gun. With the bigger-is-better, more-is-better mindset often comes a tendency to specialize to the point of excluding other forms of hunting. However, the hunters who seem to enjoy it most are those who remain diversified, and do a little of it all. Oddly, these hunters tend to be more tolerant of others, recognizing I suppose that there is not one, single approach that all should adhere to. Our friend Alan Andress often hunts with a primitive muzzleloader, carrying only the items necessary to load and fire the gun. He hunts squirrels and wild pigs simultaneously, with a relatively high degree of success. His focus is on technique, not equipment. His back-to-basics approach is grounded in simplicity. Many of us could learn a lot from this approach. As one whose truck becomes a repository for all my worldly possessions during deer season and then again in turkey season, I could certainly benefit.